This year the Cottage is celebrating ten years of being open to the public. As part of #10YearsofPLC, we’re bringing you various top ten lists related to Lincoln and the Cottage. With the recent news that the Cottage is unveiling new spaces for site rentals, we’re focusing on the beautiful grounds of the Soldiers’ Home (today know as the Armed Forces Retirement Home). Here’s a list of the top ten things Lincoln and his family saw while living at the Soldiers’ Home. For more on the construction of the Cottage, check out our post from last year celebrating the 175th anniversary of the start of construction. This 1864 photo from the Todd Family Album, shows the Cottage as it appeared in Lincoln’s time. Perhaps the most obvious thing Lincoln saw while living here were the hundred or so veterans who lived on the grounds of the Soldier’s Home. Over 65% of the residents were foreign born, with little or no family to take care of them. About 1/3 of all residents were from Ireland, and 1/6 were German. The majority of residents had served in the War of 1812 and the Mexican-American War. Ironically, the average age of a resident was only 41, about half of what it is today, and 10% of the residents were under 30. July 24, 1880 print of the daily lives of the Soldiers’ Home residents, published in Frank Leslie’s Newspaper. Quarters 1 was the first building built after the U.S. Government purchased the Riggs estate in 1851. Built by architect Lt. Barton S Alexander, the building opened in 1857 and served as the residence for the Governor of the Soldiers’ Home. It is built in the Romanesque revival style, and has 5,420 square feet. When President James Buchanan moved to the Soldiers’ Home in the summer of 1857, he used Quarters 1, returning there again in 1858. With our brand new site rental offering, we are excited to host important guests in the Governor’s Mansion once again. 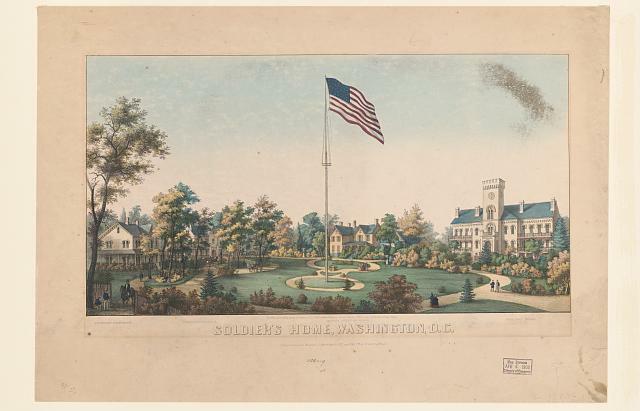 Charles Magnus’s print of the Soldiers’ Home from 1863. From left to right, the four buildings visible are: Quarters 2, Quarters 1 (through the trees), the Cottage, and Scott Hall. The Corlisle Cottage was located further South, to the viewer’s left of Quarters 2. Built simultaneously to Quarters 1, Quarters 2 was used as a residence for the Deputy Governor of the Home. Along with Quarters 1 and the Cottage, it was designated a National Historic Landmark in 1973. Today the Executive Director of President Lincoln’s Cottage lives in this building, continuing the tradition of leaders living there. Scott Hall, today called the Sherman Building (and not to be confused with a separate Scott Building), was completed in June 1857 also by Lt. Alexander. In Lincoln’s time, Scott Hall served as the hospital, dormitory and administrative building for the Soldiers’ Home, with most of the residents living there. It was named after Winfield Scott, who served as General-in-Chief at the start of the Civil War, and had been a major proponent of the Home in the 1850s. Over the years, the tower has been changed significantly twice from its original castellated version: once in 1869 a mansard roof was added in the Second Empire Style by Edward Clark. Then in 1887 it was reconfigured by architectural firm Poindexter and Flemer to feature a marble-faced crenellated form. Scott Hall (right) as it appeared during the Civil War. Right from the front door of the Cottage, Lincoln and his family could see the Soldiers’ Home Cemetery a few hundred yards north of the Cottage. Rebecca Pomroy, who served as a nurse for the Lincolns at the Cottage and the White House wrote in August of 1862 that “a more sorrowful sight I have never seen.” The cemetery was created in 1861, and at its peak in 1862 (coincidentally right as Lincoln wrote the Preliminary Emancipation Proclamation at the Cottage), dozens of soldiers were buried a day. Today it is the oldest national cemetery in the country, predating Arlington, and is home to about 14,000 graves. The Corlisle Cottage was the fifth building on the grounds, after Riggs’ Cottage, Scott Hall, and Quarters 1 & 2. It also was completed in 1857, but was further south of the property in a more secluded grove of trees. During Lincoln’s time at the Soldiers’ Home, Secretary of War Edwin Stanton lived in the Cottage. In 1876, the Soldiers’ Home completed the Barnes Hospital on the site where the Cottage had existed. The Soldiers’ Home is the third-highest location in Washington, D.C. Thus, it provides great views of the city. From the top of the Scott Tower, Lincoln could see down to the Smithsonian Castle, on the National Mall. Union Soldiers used semaphore and other messaging technology to communicate between the tower and the Castle. For example, on August 24, 1864 Lincoln witnessed a nighttime test of Morse code using calcium lighting between Scott Tower and the Castle. Once, in September 1862, an accused spy was caught trying to ascend the tower to provide reconnaissance. Past the Castle in the distance, Lincoln could see Virginia. In the other direction from the Castle, Lincoln and Union soldiers could see the fighting at Fort Stevens from the Scott Tower, and past that into Maryland. In fact, Confederate General Jubal Early partly blamed the views from the Soldiers’ Home for preventing his army’s success in the 1864 battle. “We could not move to the right or the left without its [sic] being discovered from a signal station on the top of the Soldiers’ Home,” he wrote in his autobiography years later. In September 1862, General James Wadsworth dispatched two companies from Pennsylvania to guard the President and his family at the Soldiers’ Home. The 150th Pennsylvania was named the “Bucktails” due to the deer fur they put in their hats. 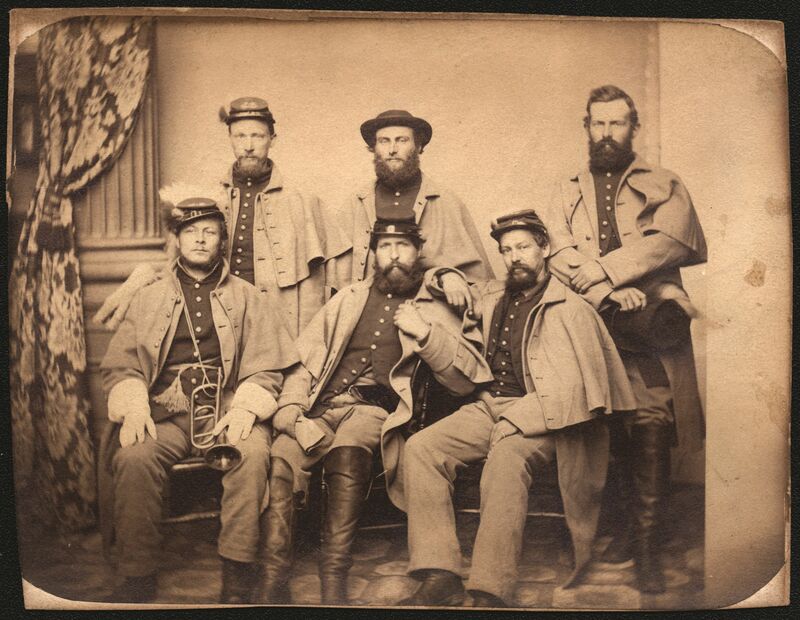 The Lincoln family grew quite close to the soldiers: Tad became an honorary “Third Lieutenant” of the Company; the Lincolns’ household staff sometimes gave the soldiers extra food; and Lincoln himself befriended several members of the Company.